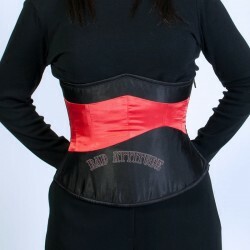 Under Bust Corsets There are 12 products. Bee Corset Created from black Tiny Dancer with 4 rows of ribbon. The Long Line Hidden Corset is one of our most popular with brides, cross-dressers and serious waist trainers. The Harlot waist cinching corset is a masterpiece of shape and design. Gored hips that create a stunning hourglass shape. The Vixen waist cinching corset is a masterpiece of shape and design and great for most body types, but not those with thin hips. This corset was created for those who can cinch down at least 6" and up to 12 full inches of cinching power. Our most severeunder bust corset. The Maiden Corset one of our most serious tight lacers is perfect for anyone who can cinch 5” or more and the corset aficionado. One of our top sellers, the Duchess Corset, is a contoured Victorian underbust that is great for narrower rib cages.